This past weekend, the Goshen College community once again gathered to celebrate and honor the life and legacy of the Martin Luther King Jr.. 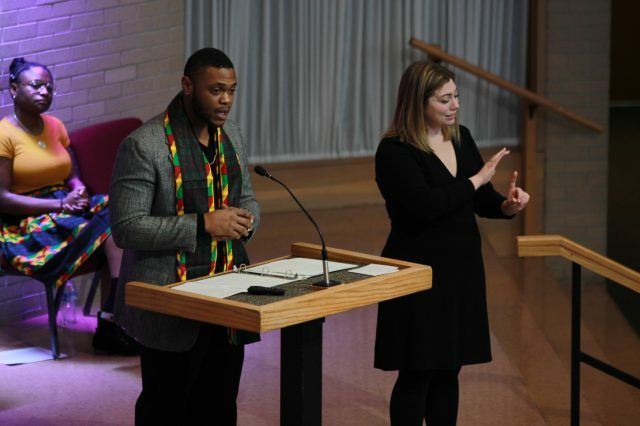 This year marked the 35th annual Martin Luther King Jr. Day celebration at Goshen College. The first event to take place was the Martin Luther King Jr. Coffeehouse, which was held the evening of Sunday, Jan. 20 in Sauder Concert Hall, a change from prior years. Dr. LaKendra Hardware, chair for the Martin Luther King Jr. celebration committee and associate director of student life for Diversity, Equity and Inclusion, explained the reasoning behind the coffeehouse being moved not only to a new location, but also from its usual Monday morning slot to Sunday evening. “The pace was very short and you only had a limited amount of time,” Hardware said. The new format allowed for a longer and more formal event. This year’s event included a collaboration with the English department, featuring the S.A. Yoder Lecture Series guest speaker for the first time. After all the students had performed, Clark was welcomed to the stage. “For me, poetry has always been a means for survival,” Clark said. She then proceeded to read several original, published poems that centered around themes such as race. The coffeehouse concluded with a panel discussion featuring Clark, and three student performers—Alia Byrd, Terra Kincy and Fabiola Jasso. The panel was moderated by Ann Hostetler, professor of English. Dr. Regina Shands Stoltzfus, associate professor of peace, justice, and conflict studies, opened the convocation by reciting the poem “A dead man’s dream,” by Carl Wendell Hines, Jr..
Kincy, a sophomore, and Clinton Stroble, a senior, also spoke at the event. Kincy, a graphic design major from Memphis, Tennessee, spoke of her experience of growing up in the town where Martin Luther King Jr. took his last breath. Kincy spoke about the Holy Week Uprising, which was a wave of civil disturbance that swept the United States following the assassination of Martin Luther King Jr. on Apr. 4,1968. In his portion of the convocation, Stroble discussed the continuing legacy of MLK, and actions moving forward. Later in the afternoon, there were two breakout sessions held in the Church-Chapel, one serving as a processing space, and one focusing on the role of the individual in the movement. The King events concluded with a vigil Monday evening.